Ranging from trendy, short-term diets to substantive, long-term lifestyle changes, there are myriad approaches to nutrition. While some people require a therapeutic diet for specific medical needs, others simply need a shift in mindset to approach their nutrition in a more balanced way. Experts debate the best way to help people make healthy changes; some researchers and dietitians advocate more structured meal plans and calorie counting, while others recommend an approach called intuitive eating. Intuitive eating holds that, instead of ignoring feelings of hunger in order to limit calories, people tune in to their innate hunger and fullness cues and eat accordingly. This evidence-based approach developed by two registered dietitians, Evelyn Tribole and Elyse Resch, challenges more traditional approaches to weight management. The dietitians noticed that many of their weight-loss clients tried diet after diet, but lost little more than self-esteem. Oscillating between restricting their intake and bingeing, they would cycle between high and low weights, and ultimately feel guilt and shame about their bodies and behaviors. Tribole and Resch decided to try something new. The two theorized that if their clients could better detect their own satiety signals, much like a child does, they would see great success in stabilizing their weight, improving their eating habits, and moving toward a healthier relationship with food. This practice-inspired approach is now supported by scientific evidence as a way to balance optimized nutrition while preventing disordered eating. Women who eat intuitively are more likely to have a lower BMI and fewer disordered eating symptoms compared to women who diet. In addition, those who participate in intuitive eating interventions tend to have equally good outcomes in measures of metabolic fitness, and better psychological outcomes such as a decrease in body dissatisfaction, compared to traditional diet programs. The following guidelines are drafted to work contemporaneously to help you cultivate healthier relationships with food, exercise, and your body. This principal eschews promises of quick, easy, and permanent weight loss. It also allows for feelings of anger at a thin-obsessed culture, and encourages channeling that passion into working on your health in a more holistic way. Hunger is a biological signal that your body needs energy. When ignored, it leads to a ravenous state that often spirals into out-of-control eating. Acknowledging modest hunger now averts rapacious eating later. Start looking at all food as something you’re always allowed to have. Deprivation of off-limits foods makes them all the more tempting. When given the opportunity to eat them later, you’re likely to binge way more than you ever would have otherwise. The food police can be a voice in your head, or another person who nags you with rules that make some foods “good” and others “bad.” There is room for all foods in your diet unless you have an allergy or intolerance. Once you can honor your hunger and feel at peace eating all foods, you should be better able to stop eating when comfortably full. Any food can leave you full, but not all foods will leave you satisfied. Feeling relaxed when you eat, and eating foods you enjoy, will increase the overall pleasure of eating. Food is inextricably tied to emotion. And there’s nothing wrong with a bit of celebratory pizza or comforting ice cream here and there. But emotional eating numbs feelings without helping us actually work through emotions, likely leading to guilt later. Just as there are tall bodies and short bodies, and people of different hair and skin colors, there is diversity in body shape that is entirely natural. Accepting this is essential to a healthy mindset. When you emphasize how exercise makes you feel — stronger or invigorated — as opposed to metrics like pounds lifted or calories burned, you’ll be more motivated to get moving. Focus on exercising in ways that bring you joy. Alongside a good relationship with food, small tweaks called “gentle nutrition” may help balance your mental and physical health. Check in with yourself often and understand that this is an ongoing process. As long as you’re taking more forward steps than backward ones, you’re progressing. Meeting with a registered dietitian for all of these steps is incredibly helpful, but particularly so in the final step. Fruits and vegetables are obviously great, but nutrition is often different for each individual, especially when medical diagnoses are involved. Who Is Intuitive Eating For? Whether you want to increase your fitness level, or you have a specific nutrition condition like diabetes, intuitive eating principles can be incorporated into a long-term approach to your overall health. However, intuitive eating is not a weight loss diet. In fact, it directly challenges the idea that weight loss diets should be prescribed to people in the first place. In some cases, you may need to consult with a registered dietitian who understands intuitive eating and can give you a personalized, holistic nutrition plan. “Some people do need a special diet for medical nutrition therapy that goes beyond their relationship with food,” Majumdar says. Intuitive eating is all about leaning into our innate cues of hunger and fullness, and listening to internal wisdom to help guide food choices. That runs counter to relying on external guidelines such as counting calories or macros. How Does Intuitive Eating Differ From Mindful Eating? Intuitive eating and mindful eating share a number of similarities. Particularly those involving the enjoyment of food as part of a relaxed experience, and learning the ways in which food can nourish your body in a positive way. 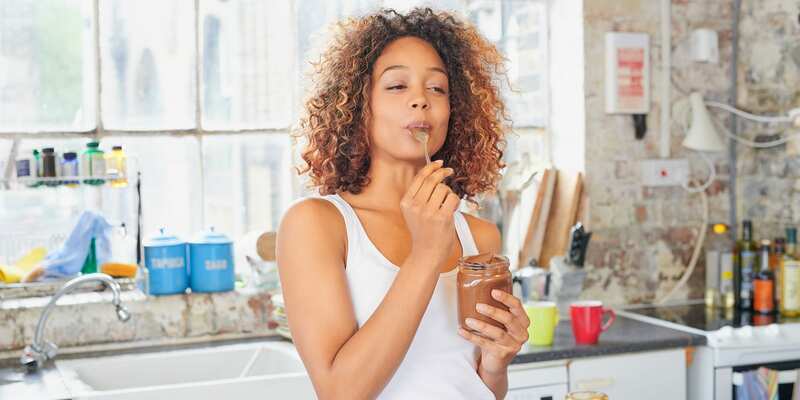 Researchers looking to differentiate the two methods have found that mindfulness is emphasized in both mindful and intuitive eating, but that the latter goes further, particularly with its unconditional permission to eat when hungry. Intuitive eating was also found to have a positive impact on variables like BMI and disordered eating; mindful eating was not. For most people, the best way to get started with intuitive eating is to read the original book “Intuitive Eating,” and follow the exercises in the accompanying workbook. Some of this work is hard to do on your own; a registered dietitian can help guide you through each principle, and individualize a plan to move you toward a balanced, healthy eating pattern and body image.